Our Abpromise guarantee covers the use of ab49873 in the following tested applications. WB 1/10000. Predicted molecular weight: 42 kDa. 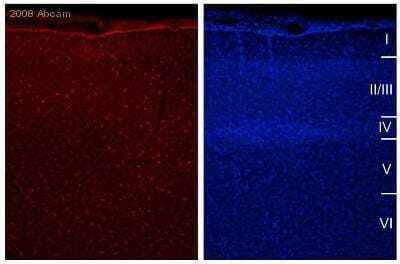 ab49873 at 1/5000 staining cultured mouse astroglial cells by ICC/IF. 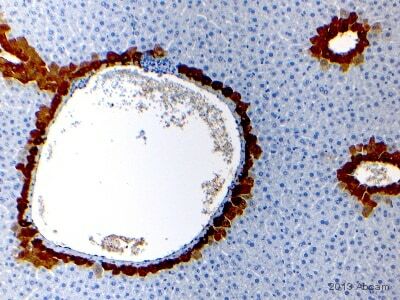 The cells were paraformaldehyde fixed and permeabilized with TritonX100 before being blocked and stained with the antibody for 24 hours at 4°C. 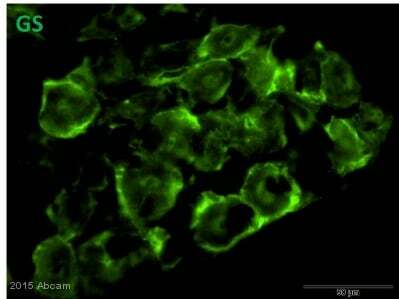 An Alexa-Fluor ® 594 conjugated chicken anti-rabbit antibody was used as the secondary. 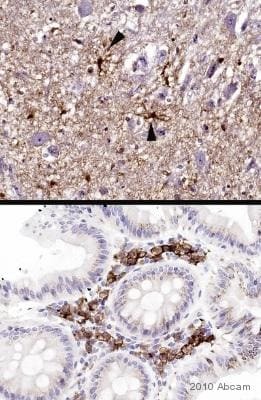 Glutamine Synthetase antibody (ab49873) immunohistochemistry on rat brain and kidney tissue (formalin/PFA-fixed paraffin-embedded) sections. 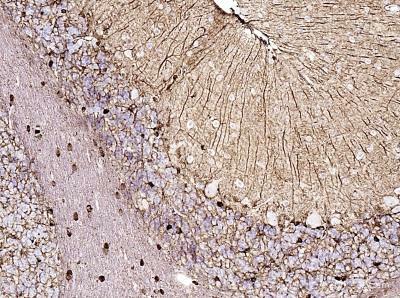 Rat cerebellum and rat kidney sections were incubated with ab49873 (1/21000) for 2h at RT. Antigen retrieval was performed by heat induction in citrate buffer pH6. 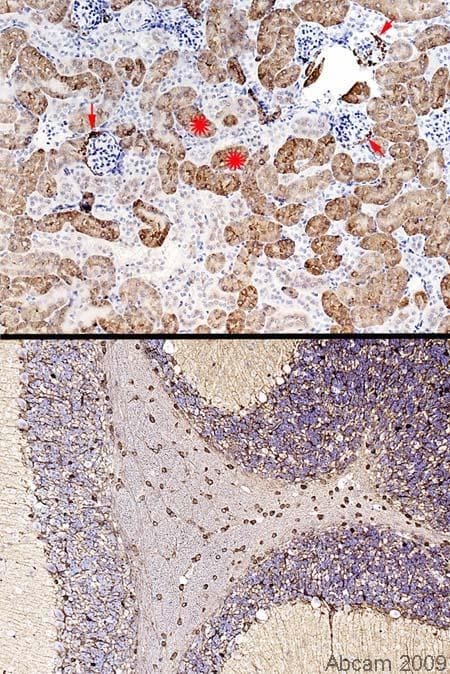 The upper panel shows immunoreactivity in rat kidney, apart from convoluted tubule positivity (proximal: see asterisks) there is positivity within the glomerular capsule (perhaps the parietal epithelium: see arrows). In the lower image (cerebellum), apart from astrocytic glial cell body and process positivity, I note that what I think are oligodendrocytes in the grey matter, are also positive. 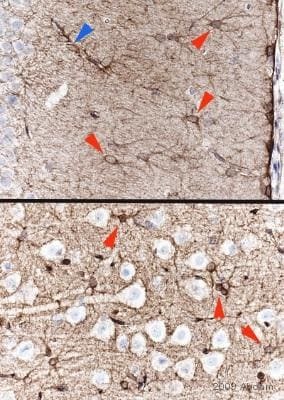 In the corpus callosum of the same section (and all other major axonal tracks of this brain), linearly arranged cells are also positive: these are known to be oligodendrocytes. Publishing research using ab49873? Please let us know so that we can cite the reference in this datasheet.